This revolutionary knife is the answer to an annoying household problem - hardened butter from the refrigerator. The lightweight knife is the first self-warming butter knife to work without electricity. It features a cutting-edge design and is made from highly efficient thermal conductive titanium to transmit heat from your hand to the blade of the knife, making spreading hard butter a breeze! 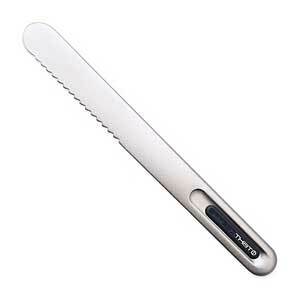 This knife will slice right through your stick of butter, with little effort, using absolutely no electricity. It is equipped with an efficient heat conducting technology that utilizes the body heat from the user and starts heating up in just 20 seconds. This innovative knife utilizes non-toxic, food-safe titanium coating that is built to last, and is safe for your family to use. Spreading cold butter has never been easier! Use for all kinds of spreads.